Purchasing Soft Clothing supports an inclusive line of clothing for all children. Soft Clothing is made with flat seams, non-toxic dyes, organic cotton and printed labels. With vibrant colors, the the sensory-friendly clothing has an inspiring look. When I received my daughter Sammy’s dress from Soft Clothing company, the colors of the dress helped inspire my photo shoot. In photographing my daughter, I thought the beauty of the dress really came out. The company has a unique style with vibrant colors this summer, which fits with the latest trends. Dressing my daughter in Soft Clothing was an easy choice. The clothes were incredibly comfortable and gave her plenty of room to move. As we played outside, my daughter could run easily. Even though the weather was hot, my daughter had a nice breeze and she enjoyed the light fabric. My daughter had the best time getting into her role as an artist for my photo shoot. 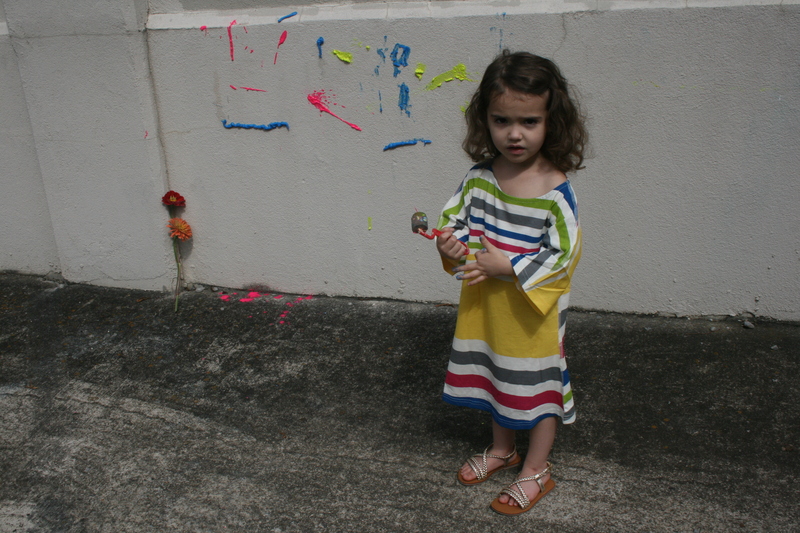 As I helped graffiti the wall with washable kid paint, Sammy was super comfortable in her Soft Clothing. I love how the clothing is made with printed labels, non-toxic dyes, flat seams, streamlined styles, and organic cotton. Looking back as I update this article a year later, while I transfer my writing from Yahoo to Theresa’s Reviews, my daughter still wears her Soft Clothing dress. The dress is a favorite. Because the dress had a loose design, it still fits great. My daughter has worn the dress for the past year to church, preschool, and around the home playing in the yard. In the future, I will be excited to pass the item on to my younger daughter.